Transit’s newest train designation is not long for this world. When the MTA announced on Friday that the V train will be cut and the M extended along Sixth Ave. and Queens Boulevard during the week, they put a eight and a half-year-old train on life support. Barring an economic miracle, the V train’s tombstone will read 2001-2010, and it will be a train few will miss. Today, we roast the V train. It runs a slow local route from Second Ave. on the Lower East Side to Forest Hills in Queens via the 53rd St. tunnel. Designed to alleviate overcrowding along the Queens Boulevard line, the train never garnered much love, and transit advocates saw a promise of express service in Brooklyn that remains unfulfilled. That bright future won’t come to pass until the MTA’s financial picture improves. Instead, let us revisit the history of the maligned V.
For years, the F train ran express in Queens to 179th St. via the 53rd St. tunnel. The MTA had long hoped to connect the 63rd St. tunnel, opened in the mid-1980s, to the Queens Boulevard line, but that 1500-foot section of tunnel would not open until December 16, 2001, nine years after designs commenced on the project. With the new tunnel connector available, some IND Sixth Ave. train could run in Queens and into Manhattan via the 63rd St. tunnel while the other could run into Manhattan via the 53rd St. tunnel. Enter the V train. The authority first announced plans for the V train in early December of 2000. The new local train was meant to, in the words of agency spokesperson Melissa Farley, ”relieve some of the pressure on the E and F lines.” Originally set to open in August 2001, the 63rd St. Connector and new train line were meant to increase capacity along the Queens Boulevard line from 41 trains per hour to 50. Long before the first V train hit the tracks, though, the line was beset by controversy. Some politicians wanted the train to run 24 hours and also into Brooklyn, but the going got tough when the G came under fire. At a May 2001 meeting, the MTA approved the V but slashed the G. Instead of running to Forest Hills at all times, G trains were to terminate at Court Square during the week due to capacity demands along Queens Boulevard. Brooklyn and Queens politicians were up in arms, but the MTA gave them only a moving sidewalk in return. Today, though, the V is the V. It offers a slow ride from Queens into Manhattan but only by a few minutes. Those who opt for the local can often get a seat even during the peak hours, and with two different tunnels providing express service from Queens Boulevard, the route adjustments have simply became a fact of commuting life. In a few months, the M will take over this tortured route, and the V with its controversial past will fade into subway history. Who knows what fates await the Brooklyn-based F express plan? Who knows how much more crowded the trains along the BMT 4th Ave. line — currently served by the M — will be? For now, these are the last days of the V, a slow route but one that eventually found its purpose. The Straphangers’ Campaign’s line profiles say that the V has below average crowding levels. I wonder what the crowding would be like if the F and V switched Manhattan tunnels. In particular, Roosevelt Island passengers would have an easier time boarding rush hour trains. The V would be virtually empty… Without the Lex Ave in-system transfer the V would be missing a lot of its passengers. As explained to me by a Senior Transit Official back then, the way they saw it was there were two main draws: Express service in Queens, and routing via 53 St. So the F stayed express but went via 63, and the V via 53 to try to distribute the load. Keeping the F express and via 53 would give the V very little ridership. Just from the local stations west of Roosevelt that were going to 6 Ave.
As a historical note, the original plan was for new trackage to keep going east from the 63rd St tunnel, with few or no stops, referred to as the Queens Super Express. It would have tied into Queens Blvd much later, I think around Union Tpke. When they built the connection they did leave bellmouths in Long Island City so additional trackage could be built. I think that would be the way to access LGA. The plan was to have Queens Super-Express run on the LIRR and return to the QB subway at Forest Hills. It would’ve saved only one stop, Roosevelt-74th. The most interesting thing about the new M route is that both terminii are in Queens. That has to be a first. The E used to run from Jamaica to the Rockaways. You’re right. It hasn’t done that since 1976 though. So, not a first for the city but for the first time in nearly 35 years. In the last days of the old JFK express, the train ran from 21 St/Queensbridge to Howard Beach. I know it wasn’t a regular line, but it did run from Queens to Queens. Not only that, you can take a bus from Forest Hills to Metropolitan Av in about 25 minutes or so. In Montgomery County MD, you have a similar situation with Metrorail’s Red Line & Ride On busses, where it takes only a half-hour to take the bus from Silver spring to eitherRockville or Bethesda & the train ride is over an hour. Both of these examples are rare, however very interesting on how it just worked out. The V is the perfect train for me. I can take both the V or the R to and from work, but while I can get a seat on either going to work, I prefer the V going home as I always get a seat on it and rarely get one on the R. I will miss it. I agree. The R and V provide a really great set of connections for anyone (like myself) who lives off a Queens Blvd local stop. You can connect with anything in midtown and most things are withing walking distance of the R or V. That’s not going to change just because they rename and extend the same route (V+M). For those using the 2nd Avenue stop on the F, the V will be missed. It was always nice to have an often empty train terminate at my stop. I won’t miss, however, deciding which train to bolt for going uptown – an F, a V, or a V on the downtown platform. 2nd Ave is not a great full-time terminal station. The V would have been much more useful if it was extended to Jay St. this would have permitted it to pick up/drop off transfers to the A C J M Z trains, and take some of the load off the F. According to track maps, there is a switch by the Bergen St express stop where the V could be turned, and the gap created by the G diverging upstairs at Bergen is when you send the V back out. I’d imagine the delays of having to get everyone off the train (I noticed this usually takes 2 or 3 minutes) would delay things at Jay more than it’s worth. And there’s still a transfer at W4 for the A C, and now the M will have the transfers to the J and Z. So this sort of accomplishes that. The V train rocks. I used to work along 6 Av and I often made short trips between 6 Av IND local stations. The combination of the F and V meant that waits between trains were very short. It seemed like the 6 Av local had the best service in the city. I doubt that this will change now that the letter is M.
The newspapers are making this seem to be a much bigger deal than it really is. Between last week and this week, the only thing that changed about this in the service cuts proposal was that the combined line would be called the M instead of the V! That doesn’t affect the average commuter one iota. If you live off the M in Williamsburg or Bushwick and work downtown, how much extra time will this add to your trip?? If you live of the 4th Ave local (R) or West End (D) lines in Brooklyn, how much longer will you have to wait with out also having the M as an option?? Both the R and D are not the best trains to have as your only options. The FML combination at 6th Ave. and 14th St. is my favorite. Oh man, FML is priceless. It is particularly apt for those poor souls on the 1,2,3, who get off at 14th believing there is an easy transfer only to find out that the transfer requires a 1100-foot walk. FML indeed. Won’t it rather be FLM123 or 123FLM (don’t remember the order of letters and numbers)? So I see. (MFL is just as thought-provoking…) But what’s going to be the order at Delancey/Essex (sans Z), trunk lines (FMJ) or platforms (FJM)? Let’s just remember that this is a cosmetic shift. 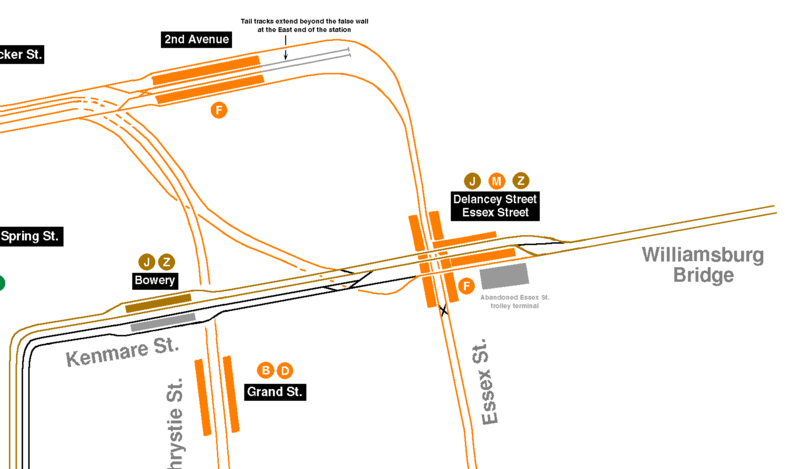 The new M train will make every V stop except one (Lower East Side–Second Avenue). What fleet type will be used on the new M line? I hope it’s the R-160 type cars, love the voices of Bloomberg on my ride. The new M route is a great idea. Many people along the M’s old route just transfer to other trains anyway. 4 av in brooklyn will have the N and R train. Its the N train riders that are getting screwed because the W is also being scrapped!!! Its the N train riders that are getting screwed because the W is also being scrapped!!! The Q will replace the W north of 57th St. to Astoria during the hours the W currently runs. The N train riders will probably be ok.
Do you know the answer to the question I posted above reguarding the fleet type on the new M line? The M’s rolling stock should remain as it is now, especially because the Sixth Ave. M trains will be only as long as the current BMT Nassau St. M trains. It’s a question of yard assignment. If this train is based in Jamaica (as the V is) you get something from there…R-160s are going there but I don’t know if it will become all new trains soon. They’d have to make 8 car units. If the train is based out of East New York, as the M is, it comes from there. They are buying so many R-160s you may wind up with those in either case. My first instinct was to predict Jamaica, but given the car legnth issue ENY may make more sense. Time will tell. There is also a supervision issue – the V was run by the same managers as the F, while the M is with the J managers. Based on legnth you’d expect the new route to go with the F.
Ben I already know about the Q going to Ditmars Blvd. I’m talking about N riders lose thier express service as the N will be local going thru Montague st tunnel and downtown Mnhtn. That’s my point.. N train becomes local at all times!!! No, the N will be running over the bridge, except at night. It will only be local north of Canal. The point of the V wasn’t to give riders at express stops a slow ride into Manhattan – it was to give riders at local stops direct service to 6th Avenue and to 53rd Street. Before the V was introduced, half of the Queens locals didn’t go into Manhattan at all! If you wanted to get to 53rd from a local stop, you transferred at Roosevelt or Queens Plaza to the E or F. That was the only way to do it. Riders who transferred at Roosevelt did get the side benefit of an express trip from there, but riders who transferred at Queens Plaza gained nothing. And E and F trains were very crowded, because they carried not only passengers from express stops but also passengers from local stops who simply wanted to get to 53rd. Enter the V. Now people at local stops have direct service to 53rd. At Roosevelt, of course some opt to transfer to the express, but others opt to stay on the local the whole way. And passengers boarding the V between Roosevelt and Queens Plaza have no reason to transfer. With the V now carrying many passengers directly into Manhattan, crowding on the E and F has been reduced. Nobody ever expected the V to become as crowded as the E. The Queens Blvd line, by its nature, attracts much more express ridership than local ridership. So why not let the local riders stay on the local and avoid contributing to express crowding? Of course there was confusion on the first day. There’s always confusion on the first day. If the F and V were switched, as some have suggested, local riders looking for 53rd would once again have to transfer to the express. Local riders between Roosevelt and Queens Plaza would be even worse off than they were with the G, since the V wouldn’t even take them to the transfer point they need! They’d have to wait for the R and then transfer at Queens Plaza. The V would lose riders; the R, E, and F would all become even more crowded. Not a good idea. The current arrangement gives local and express passengers a nice mix of options. Also, by allowing local trains to service 23rd/Ely/Court Sq, anyone can take a local train and transfer to the G. If the V ran under 63rd St, you would have to transfer twice to get from the G to a local stop along the route. Does anyone know why the new M will miss the 2nd Ave station? Is it because it couldn’t then make the turn to the JM line pre/post Essex/Delancy? Sure do. It’s because the Chrystie St. Cut bypasses 2nd Ave. It connects the Essex St. stop with Broadway/Lafayette. Take a look at the track map as well.